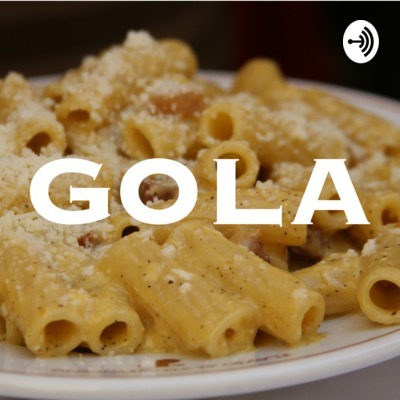 Gola is a podcast from food journalist Katie Parla and culinary historian Dr. Danielle Callegari about Italian food and how it connects to history, culture and society. Listen as Katie and Danielle break down the finer points of Italian food, culture, and Italian food culture. They'll take you along for the ride as they talk about buffalo mozzarella, 'nduja, nucillo (a.k.a. nocino) and more! Don't be scared if the subject of medieval witchcraft comes up. Go with it! Contact Katie and Danielle at golapodcast@gmail.com. This week Katie and Danielle finally talk about the apex of Italian cuisine: pizza! With International Women's Day upon them Katie and Danielle dedicate this week's episode of Gola to a conversation about women and food in Italy! Just in time for Carnevale and the upcoming Lenten season, Katie and Danielle do a quick overview of the foods Italian eat while they're not supposed to be eating! Listen this week to hear the first of many episodes on the intersection between organized crime and food systems: the unfortunate truth about the mafias of Italy and its food. Learn about Italian cookbooks old and new this week with your favorite gluttonous duo! After one whole week thinking about vegetables your favorite gluttonous duo is back to talking about the best known meat in Italy: bistecca alla fiorentina! For the first episode of the new year Katie and Danielle talk vegetarianism, veganism and vegetable-focused diets in Italy! This week listen to your favorite gluttonous duo talk about delicious, rich Italian holiday breads: pandoro, panettone, panforte, and more! Hungry for some holiday treats? Listen to your favorite gluttonous duo talk Italian-Jewish cuisine just in time for the first night of Hanukkah! This week hear Katie and Danielle talk about their favorite underrated Italian sparkling wine that looks like cherry coke but tastes better and comes with a double dose of history: Lambrusco! Thirsty for more Gola? This week Katie and Danielle talk aperitivo and where and when the now ubiquitous spritz arrived on the scene! This week listen to your favorite gluttonous duo talk about Italy's love affair with small fish and the weird liquids they can make! This week your favorite gluttonous duo wanders through the world of Italian wine, getting our feet wet for many future episodes on vino and veritas! The first of many episodes where the Gola team will explore pasta--starting with what makes it delicious and what makes it Italian! This week listen to your new favorite Italian food obsessed duo talk about coffee in pre- and post-Starbucks Italy! In our latest episode we talk about Italy's 'oro bianco' (white gold): mozzarella di bufala! In our second episode we get spicy with spreadable Calabrian salame. Katie and Danielle talk about the weird witchy walnut liquor "nocino," known as "nucillo" in dialect. A quick introduction to our podcast about Italian food, and all the history and culture that comes with it!